Owning a good espresso machine gives you the opportunity to enjoy a good cup of your favorite drink whenever you want. There are variety of devices in the market all promising to give you quality espresso. This guide, however, gives you the best espresso machine under 300 $ which you can use to brew your favorite drink on daily basis. Whether you are a latte enthusiast or a cappuccino connoisseur, either of these bestselling espresso makers in 2017 will meet your needs. Owning a good machine in your kitchen has several advantages. It gives you the opportunity to enjoy whenever you want. Within less than 30 seconds, you will be guzzling good-quality espresso. This is a fraction of the price of getting it daily on coffee stands. If you can manage to do it well, it will be as amazing and tantalizing as the Starbucks coffee. Every espresso maker on this list has a unique design that makes it stand out against its competitors without compromising the quality of the drinks. Owning one gives you the opportunity to make a barista-style beverage from the comfort of your kitchen. Even if you are an amateur in coffee making, with your espresso maker, you can learn easily. The learning process can be pretty easy and intuitive. Over time using one of these espresso makers, your coffee making skills will improve. You will very fast start brewing the best and your favorite espresso drinks at the comfort of your kitchen. These espresso machines are the best in 2017 to buy for under $300. They will give you an opportunity to make some of the most incredible espresso in you home or office. In addition to their competitive prices, they offer an excellent range of features in comparison to their expensive competitors. Their affordability gives you an opportunity to own an espresso machine without necessarily breaking the bank. DEDICA is a great espresso machine to start with when you want to own a affordable espresso maker and be within the limits of your budget of $ 300. It is among the top rated espresso machines on the market today that will take your coffee experience to the next level. It is small in size only measuring 6 inches wide, yet harbors a lot of benefits which we will show you in our De’Longhi DEDICA Review. – this machine is small, with a sleek stainless design that looks great on your kitchen counter. It doesn’t take much space hence the best if your kitchen is not spacious. If you looking great small espresso machine to save some space in your home or office than DeLonghi DEDICA is great choice to buy for you. You can see Delonghi Dedica dimensions in our table above. – DEDICA uses a Thermo block technology to heat the water. It is rather fast and only takes 30-40 seconds to heat the water. Additionally, it has a self-priming heating system which makes it ready to brew the coffee when you are ready. Use of this technology in the DEDICA makes your coffee brewing experience seamless and improve on your experience. 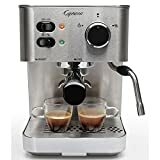 – the pressure pump gives this great espresso machine the ability to create rich, delicious, and steamed milk froth for your cappuccino or latte. – this feature helps prevent your brewing experience becoming messy. It gives the DEDICA the ability to deliver either one or two espresso shots. It has the benefit that you can customize depending on your preference. – the cup warmer on the top of this machine helps minimize heat loss during post-extraction in coffee brewing. The cup warmer also features a stainless steel ribbon which is illuminated with a control panel. You use this panel to make your custom beverages. You have to reprogram the buttons every time you are using it. Easy to tip over when attaching or removing the port filter due to its small size. You, therefore have to use both hands. Delonghi EC680M DEDICA is small in size but produces some of the best quality espresso and it worth to buy. On our list Best Espresso Machine Under $300 Delongi Dedica is the best buy option. Quite affordable top rated espresso machine for home or office. It is most suitable for someone with a limited kitchen space yet wants to be making their coffee. To use the standard sized coffee mugs, you will have to remove the drip tray. Otherwise, you should consider buying small coffee cups. Read our Capresso EC PRO honest review. If you are connoisseurs looking to experiment in making great coffee at home, the Capresso EC PRO is a great pick. Its features enable you to have full control your coffee making experience. It also offers you a professional barista feeling when using it. This is great choice to buy for under $300 espresso machine in 2017. If you need professional look espresso machine for your office you definitely should consider tu buy Capresso EC Pro. Read what are the qualities, characteristics, advantages and disadvantages of Capresso 118.05 EC PRO. – this is the most impressive feature about this espresso machine. The filter is for building pressure. It produces pressure depending on the coffee beans age, size and how they tamper. It gives you full control of the coffee you make by changing the bean size, tamper, and age. Also, it allows you to make best espressoo like a pro although you will need to take your time to learn how to. However, once you learn, you will be in a position to produce hot and thick beverage concoctions. -sprout espresso filter- with the two filters, you can easily brew two cups at once just like you would in other expensive espresso makers. The double filters improve Capresso versatility. You can use the double sprout as you learn to use the bottomless filter. One filter gives you full control of the coffee you make while the other is for convenience. – each feature of the Capresso 118.05 makes it worth to buy. The frothing wand especially gives you the opportunity to steam and wand your latte and cappuccino while using this machine. It also makes brewing the Americanos easy as it doubles the hot water dispenser. – with this feature, you have the option of making either single or double shot simultaneously. It makes crafting of drinks for two easy. Capresso comes with a full booklet of instruction hence making it easy to learn how to use it. It has a water reservoir conveniently at the back making it easy to clean and move the espresso machine. It makes quality espresso and with the right temperatures with portafilters improving the quality and the taste of the espresso shots. The foam wand produces fluffy foam, and it is easy to use and highly productive. Conclusively, the Capresso 118.05 EC PRO Espresso and Cappuccino Machine has a high-quality build suitable for everyday use. It is also well sized for easy handling when priming the machine. With two handles in place, you can use one to load while the other is tampering. Considering all the features, this is one of the best espresso machine under 300 currently available on the market. 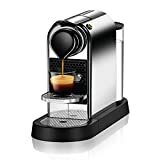 Anyone who knows their espresso preferences quite well and is willing to make the larger investment will find Nespresso Citiz espresso machine worth to buy. You do not need to have prior experience in making your coffee or have barista skills to use this espresso machine. 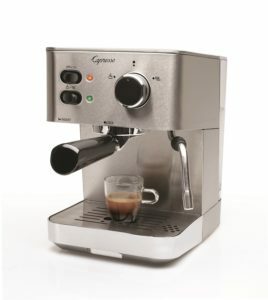 It is one of the most famous espresso makers under 300 dollars, easy to use, and produces great espresso rich in crème. This Nespresso model recived “Good Design” Award. If you are considering whether to buy this espresso maker read more about it and learn more about the characteristics, the pros and cons..
– it comes in small size hence suitable for less spacious kitchens. Nespresso C112 Citiz is also the best buy if you want minimal cleaning of its stand. – the water reservoir is large enough and holds up to 34oz of water which is sufficient to make 12-13 cups of water. This water can last you for a longer time saving you the time to keep on constantly filling it. However, how long the water lasts depends on how often you make your nespresso. Also, if you compare with other espresso machines, this water tank is not large enough. The real deal with this size is that it is hard for calcium to build up at the bottom and especially if you are using hard water. Appearance- mostly made of natural colors that are easy to blend with your kitchen. It has a sleek, cool looking, and retro design. – this element comes fully integrated into the espresso machine, therefore, no need for extra space to place it. The Aeroccino gives you an opportunity to easily make lattes, iced coffee milk, and cappuccinos from the comfort of your home. It is easy and handy to use in that you only need to add milk and press the button and within seconds you have your frothy latte. – with this feature, you do not have to wait for the machine to heat up. It is also automatic with auto shut kick starting after nine minutes after use; you, therefore, don’t have to switch it off. – Nespresso uses the capsule system, and you can try as many flavors as you want. The system is specifically designed regarding size. It is easy to insert and adjust the capsules and can hold 5-6grams of fresh coffee grinds to make one cup depending on preferred flavor. The real deal, however, is the used capsule holder. It prevents daily emptying and depending on how often you make coffee; you can empty it after a week. The capsules used in Citiz espresso machine are recyclable. Has a foldable drip tray. Nesspreso C112 Citiz is top rated nespresso makers in 2017 with 4.3 out of 5 stars score. It shows you that you will not make a mistake if you buy that maker. With over 25 years in the sale, it combines simplicity and expertise to make you the most tantalizing and exquisite espresso you would wish for. This outstanding espresso maker well sorts backpackers, campers, travelers or any other person who would love to save on the power bills. It is hand operated and therefore needs no form of energy to make you enjoy your cup of coffee. It is easy to use and requires no form of experience to run it. It is one of the best buys that you can use to replace expensive espresso machines in your house. Uniterra Nomad portable espresso machine is very underated machine, but we think it deserves to be on our best espresso machine under 300 dollars list. 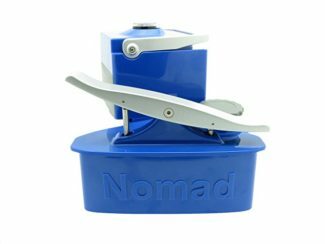 We must to write Nomad espresso machine review for for those that have not experienced this small and so powerful portable lever espresso machine. True Crema Valve – this unique feature is the real deal. It compensates the tamping and the ground level variations of your coffee. The TCV allows you to use pre-ground and still produces excellent coffee. The espresso maker will still function normally without the TCV. – it is attached to a pump gear at the base unit and an inbuilt water tank. It also features a removable cup. It has a filter assembly that consists of brew box, coffee drawer, and a basket. The UniTerra Nomad espresso machine comes in a pretty small and packable size. Nomad Dimensions: 6.5 x 6.5 x 6 inches. Weight:2.6 pounds. It is highly portable, a feature that increases its versatility. Its size allows you to bring your coffee habits wherever you go. There are several hand-operated espresso machines, but this one is an outstanding pick. It is easy to operate and produces quality crema and delicious beverage. What you require to do is fill the reservoir with boiled water and use the lever to pump 12 times to allow pre-infusion. Pump again until the espresso is done. The crema quality and flavor of the coffee depends with the grind fineness, although even course grind will produce a great drink. Before we make some conclusion we need to show you other worth mentioning espresso makers that fit into the mentioned budget. This is not our first choices for best espresso machine under 300 but you should consider these. It all depends on your preference and what you want from your espresso maker. We hope that we help you with our suggestion for some great espresso machine under 300. 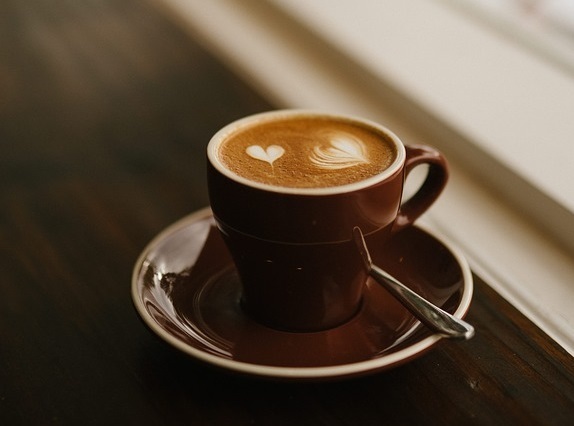 For the best espresso besides good coffee, you need a good espresso machine, good coffee grinder, cup, a little skill and a lot of love for coffee. While choosing the best espresso machine, your choice should revolve around three factors; convenience, value for money and ease to use. Doing this will make you enjoy the best homemade (n)espresso. You do not necessarily need to be experienced with coffee making for you to enjoy barista quality beverage. With a good espresso machine, you will always spice up your mornings. With these best espresso machine under 300 buying quide, picking the one that fits your needs shouldn’t be hard. 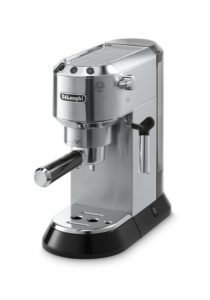 The options You’ve compiled above are great picks for any espresso lover, whether we’re looking for the tools we need to improve our technique, or just want automated convenience, all these mentioned machines are great options at a mid-range price point. I think I found the one which suits me best. DeLonghi EC680M DEDICA is better than the others on the list as a coffee maker that does not have a removable water reservoir or milk tank is very hard to clean and maintain in perfect shape, but the DeLonghi model has and it’s easy to remove and clean in a better way.